Hi friends, I’m back this week with another small organized spaces post. I am not planning these out ahead of time by the way. These are spaces I’m actually organizing in my own home. What I decide to tackle each week is usually a result of needing to find space for something or to solve an annoying problem. This week’s task involves purging books (gasp!) because I needed the space on the bookshelf for something else. I have a small bookshelf on one half of a wardrobe in my bedroom. When I moved to this house with a bigger closet I didn’t need this space for clothes so I decided to use it for books instead. I went back through the blog and realized that I last organized this particular space in 2012. It wasn’t a fond experience to look back on though. Some of you might remember that some of my books tried to take me down. You can read all about that unfortunate incident HERE. This is an older picture from that first post but it gives you an idea of what I’m talking about. I should point out that this space wasn’t really bothering me at all. 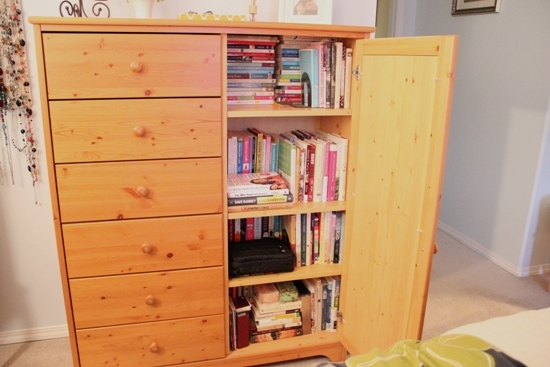 It has a door on it to hide away the clutter of it and it didn’t feel particularly stuffed. So why then did I feel the need to organize it? Well let me tell you how my brain works. I was trying to put my folded laundry away into the drawers attached to the bookshelf when I started to get really really annoyed. I had gotten a couple of pairs of some lovely pajamas for Christmas and was attempting, unsuccessfully, to jam them into the drawers where clearly there was no room. At that point I stopped what I was doing and said, ENOUGH ALREADY! I had two choices, purge down my pajama collection so they all fit nicely into the designated drawers OR find some other space for them. You see organizing is all about choices. I looked over all the pajamas I own and realized that I wear them all. Gosh I love pajamas, so cozy and warm and all. Then I opened the door to the bookshelf and realized that while I also love books, I didn’t love them (or use them) more than my pajamas. And that my friends is how I decided it was time to begin purging books. My goal was to do enough book purging to empty out one entire shelf that I could then use for pajamas instead. See not rocket science, just choices. I could choose to continue to be annoyed at my overstuffed drawers or I could choose to do something about it. For me I decided to sacrifice books not frequently read for pajamas used regularly. Of course there are other solutions to this organizing dilemma. Keep in mind that what I chose may be different to what someone else might decide. 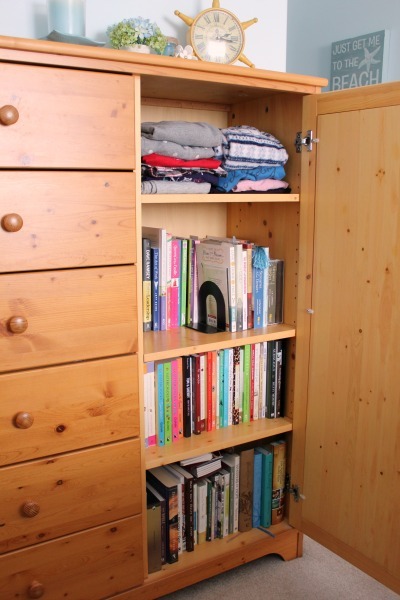 For instance, I could have “found” space in my closet for my pajamas or even moved my books somewhere else. BUT each choice has another decision attached to it to contend with. Simply adding another bookshelf to the room (so I could keep both my books and my pajamas) would require the decisions to a) spend more money and b) be okay with adding additional clutter in the room. Even the choice to do nothing is making the decision to continue to be annoyed at the situation. I felt the choice that I made was the easiest and quickest one for me to solve my problem. Choices, choices, choices. They aren’t always easy and often can be frustrating especially when choosing between two loves. Only you can decide how that will look for you but maybe today’s post will give you a different way of thinking about it. To help me with my purging books task I referred to this post titled 3 questions to help downsize your book collection. I managed to get the task done and it feels great to have solved this organizing dilemma. And in case you are wondering, I purged 45 books!! Not to worry though, I still have quite a few books AND I made extra space for my pajamas. I’d call that a win-win! How hard is it for you to go through and purge your book collection? How often do you do it? We have a lot of books. When we moved here 28 years ago we brought with us books from 9 ft of floor to ceiling bookshelves (less the space to be subtracted from same for husband’s computer desk in our apartment. We have accumulated a lot more since, we have a total of 8 – 6 ft tall bookcases, three half height bookcases, and some books I keep next to my side of the bed. Our books tend to be reference works on various subjects we are interested in – reenacting, crafts, James Bond, Louisa May Alcott, Laura Ingalls Wilder, and Kathryn Forbes being most of what we have. We keep the books in the rooms which most make the most sense. Craft books in our studio – along with one shelf of cookbooks – actually purged down from a shelf and a half, as well as the books about and by the 3 authors mentioned – including at least one first edition of LMA. In our bedroom are the James Bond books – the books that taught my husband to like reading when he was boy – in addition to the novels (some multiple editions – why? it makes him happy) there are various non-fiction books related to the subject. The books about actors, comedians, etc. from the earlier 1900s are in the basement – the old films they are in are a passion of ours and mutual love of the films and actors are what drew us together over 40 years ago. Books on English history are next to my bed for reference when watching period movies and wondering about something or someone in them – with some also in our office library. Our office library is the bulk of the books – American history and reenacting related books being most of them, with computer related books, Shakespeare and such being the rest of them. No, they will not be purged, only added as we need the reference books and the novels that are kept are old friends from childhood – I have a LMA book which was bought for me the day I was born – and will not be leaving. Like Thomas Jefferson, we cannot live without our books. It is soooooooooo hard to get rid of books. A year or so ago I finally purged my homeschool books. At least 8 boxes….hard to do, but what a weight off my shoulders. Thanks for the encouragement. oh, I forgot to say, it was SOME of my homeschool books 🙂 I will probably go through them again in a year or so after my daughter goes to University. I have the hardest times getting rid of books. I finally gave in and bought a Kindlr which i fought for years. My friend has a fb page calledfree books for hoarders and i have thousands now all on a little bitty tablet. I dont know why it took me so long. Now when i get one i already have in hard cover i donate the hard cover to the library. Best ace to donate books and is tax deductible. Books are the hardest to get rid of. I feel so guilty when I throw them away. I’m great at sorting and purging almoat everything else. It’s funny right. What do you do with the books you want to purge? I always donate mine to the thrift store Nichole. Other options include Facebook Marketplace or garage sale.